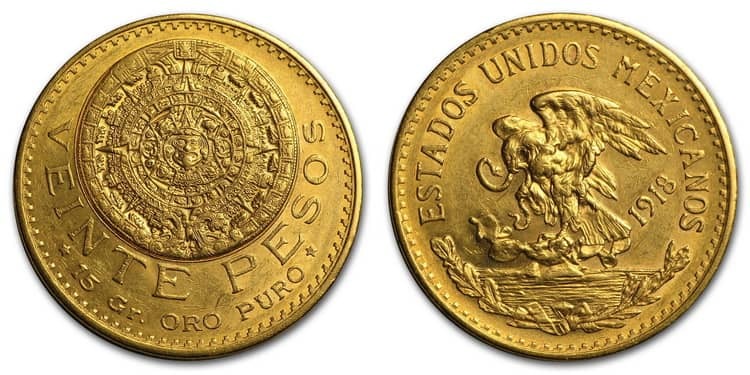 Ancient gold Mexican pesos (1959 & PRIOR) are one of the most beautiful and memorable coins in the world. Their popularity among collectors and investors is growing. The reason for this interest is the rich history of the country and the excellent preservation of each instance. Due to the fact that the composition of copper (10% copper and 90% gold), Mexican gold coins get increased strength and wear protection for a long time. The first gold coins appeared in Mexico at the time of the Aztecs — large reserves of precious metals, including silver, were located in the country. Ancient samples were used not for trade, but for rituals and as jewelry. Even in ancient times, when the minting of coins was unfamiliar to the aborigines, Mexican products made of precious metals were distinguished by high quality, detailed images and enviable durability. Did you know? 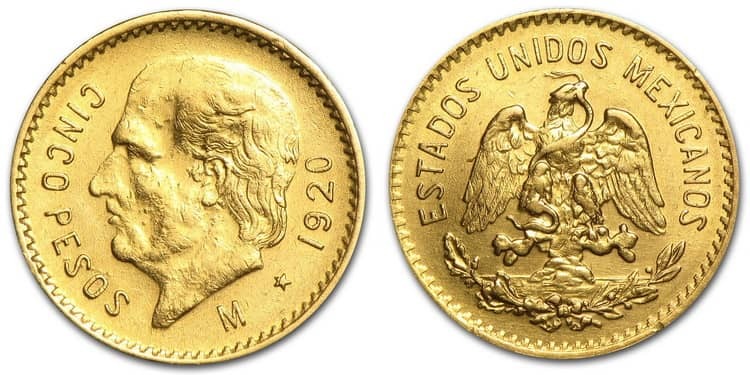 Before the advent of the most famous investment coin – South African Krugerrand (of 1967), the Mexican gold pesos (1959 & PRIOR) were the purest gold coin in the world. 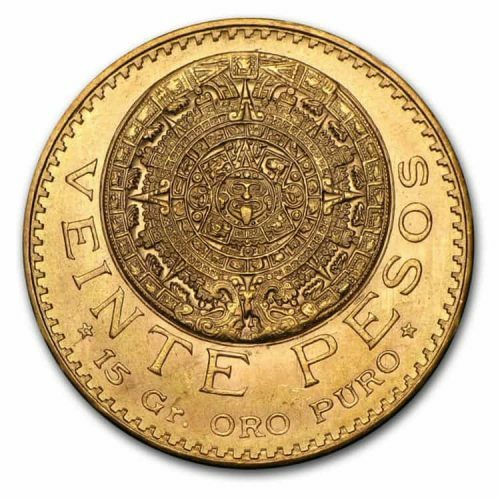 During the period of the Spanish colonization of Mexico (1517-1821) and the fall of the Aztec empire on the territory of the country, the first money of gold appeared – the peso. At first, the mined precious metal was sent to Spain, but the absence of its own Mexican currency complicated the exchange of goods between the conquistadors and local residents. In 1536, the first in the New World Mint, located in Mexico City, released the first batch of coins – reals, escudos, and then a larger copy – 5, 10 and 20 Mexican pesos. Did you know? The Spanish Empire was so extensive that the currency spread to other countries. Initially, there were eight variants of coins, previously known as Spanish dollars. They have been widely used throughout Asia, in North and South America. The currency was distributed until the XIX century. Even America accepted it as a legal tender before the creation of the Law “On Coins” in 1857. In 1808, under the leadership of a Catholic priest and revolutionary leader Miguel in Mexico, the struggle for the independence of the country began. In 1821, the rebels managed to remove from power immigrants from Europe. In 1822, the Mexican Empire was proclaimed an independent state, and in 1823 it was transformed into a republic. For a long time, the Mint of Mexico continued to mint silver coins according to Spanish patterns. This was due to the crisis in the country and the lack of precious metal. 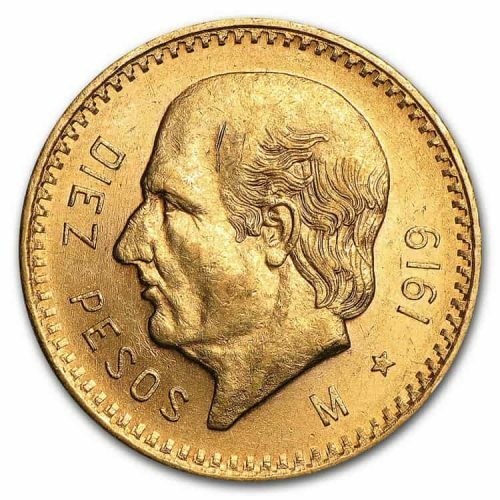 Only in 1904, the National Bank of Mexico issued the first gold peso. 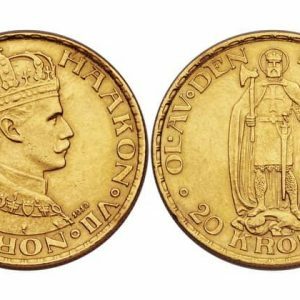 The coins of new type were produced until 1931 – until precious metal coins were abolished. On the surface of one of them was a portrait of Miguel Hidalgo, on the other – the Aztec calendar, and on the third – libertad. 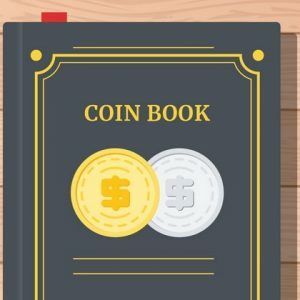 Design developed over two years and spent a lot of money on it, so the coin has become so popular and attractive among collectors and investors. Excellent appearance and a lot of thoughtful details excluded fake. In terms of beauty and sophistication, the currency of gold was not inferior to the modern Silver Aztec series of Mexican coins. Did you know? In the 20th century, the Mexican currency (peso) became the most stable in South and Latin America. This continued until the 1970s, when an oil crisis hit the country and confidence in the Mexican peso fell. By 1980, the government defaulted on foreign debts. As a result, assets and money from precious metals began to quickly drain out of the country. Investors were no longer confident in the Mexican economy and government. 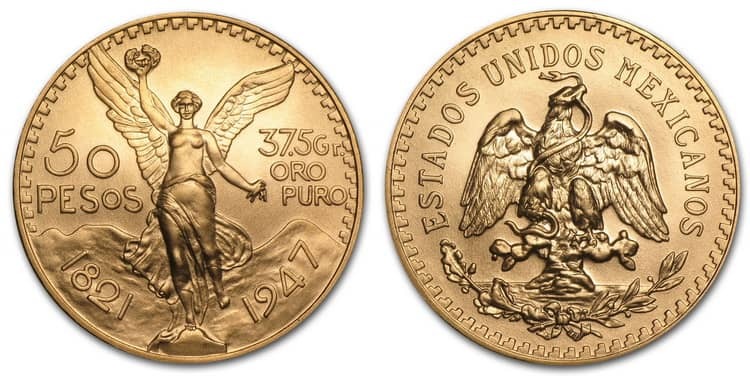 The reputation of high quality and impeccable performance of memorable copies, which the Mint of the country deserved, led to the fact that Mexico issued a series of investment coins made of precious metals. In 1981, the Mexican golden libertadas appeared, a year later, the first batch of Mexican silver libertadas were minted. Did you know? 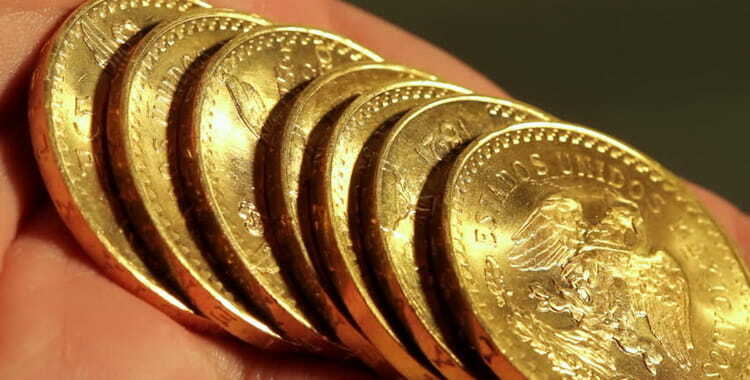 There are several reasons why investors and collectors prefer to buy ancient gold Mexican pesos. First of all, this is affected by the limited circulation with high demand. The precious metal coin contains copper, which makes it a sturdy construction. In addition, the weight of 50 pesos is 20% more than American Golden Eagle from the same alloy. Designers of the National Mint invested a lot of knowledge and money in the design of the look of the antique golden peso of 1959 & PRIOR to get a coin with rich symbolism. This feature is appreciated among collectors, because it allows you to immerse yourself even more into the ancient culture of the country and get acquainted with historical details that were not described in textbooks. Did you know? The Mint of Mexico, also known as La Casa de Moneda De Mexico, was founded in 1535 by the viceroy of Spain, Antonio de Mendoza. In the 16th and 17th centuries, the extraction of precious metals in Mexico was so profitable that almost all coins were minted from gold and silver. Only some of them were made of copper. 50 pesos 1959 & PRIOR (centenario) – the reverse adorns the national symbol of Mexico – the eagle holding a snake in its beak. The obverse is a picture of Libertad – the winged angel of Liberty, located on the top of the Mexican column of Independence. 20 pesos 1959 & PRIOR received the most intricate design. On the reverse is the national emblem of Mexico with a reference to Mesoamerican beliefs. The snake in the mouth of the eagle is a symbol of the earth, as well as the god Quetzalcoatl and the goddess Coatlicue (Aztec inhabitants of heaven). The obverse depicts the Aztec calendar – a system for measuring time among the tribes of Mesoamerica. A complex but reliable system was based on matching cycles. According to scientists, the calendar appeared 3,500 years ago. 10, 5, 2.5 and 2 pesos 1959 & PRIOR – on the reverse the classic emblem of Mexico with an eagle and a snake in its beak is depicted. On the obverse there is a portrait of Miguel Hidalgo – the country’s national hero in the struggle for independence. 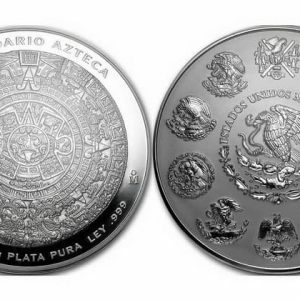 Only Mexican silver commemorative coins can boast such a thoughtful and exquisite design. Some specimens are not inferior whenever possible to admire the aesthetic value and historical significance. Metal: 90% gold, 10% copper. 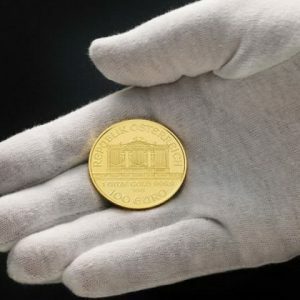 Weight: 1.2057 troy ounces (37.5 g). Weight: 0.4823 troy ounces (15 g). Weight: 0.2411 troy ounces (7.50 grams). Weight: 0.1205 troy ounces (3.75 g). Weight: 0.0602 troy ounces (1.87 grams). Weight: 0.0482 troy ounces (1.50 grams). In 1959, the Mint of Mexico produced 50,000 samples of 10 pesos, 13,000 coins of 20 pesos and 9,000 samples of 50 pesos. From 1960 to 1971 and in 1996 the original series was supplemented with a new batch of coins in the amount of 1,236,414 pieces. 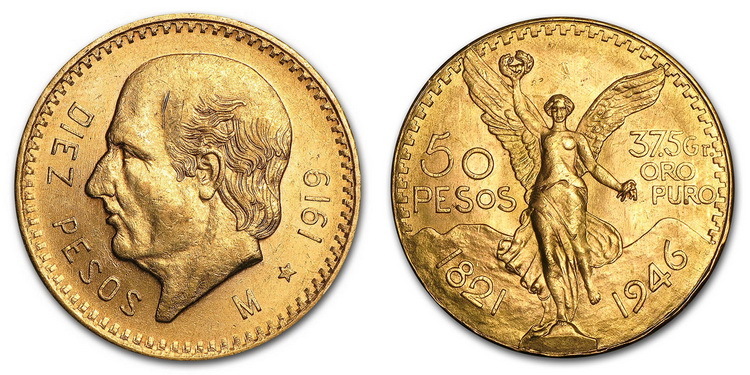 50 ancient gold pesos (1959 & PRIOR) is one of the largest investment coins of Mexico. Its cost comes to 1556 $ USD. The price of 20 gold pesos is 680 $ USD. Coins of 10 pesos are valued at the amount of $ USD 336.